Our View:GT Advanced Technologies Inc’s Financial Health Rating (FHR™) was a very weak 10 (0=worst, 100=best) for the four quarters ending June 28, 2014, and represents a 2 point downgrade as compared to a year earlier. 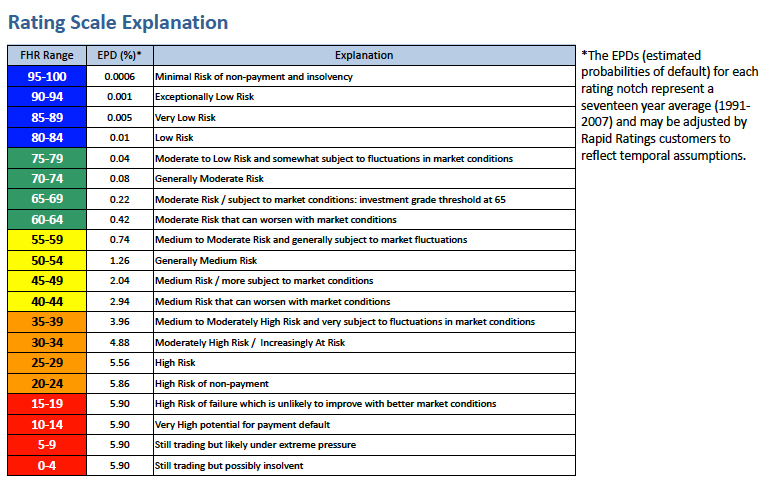 This rating sustains the company in the top half of our Very High Risk group. 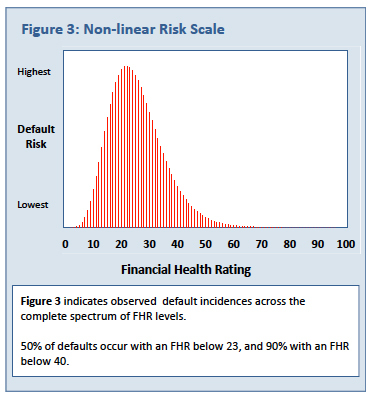 Historically, companies with an FHR at this level have demonstrated an elevated incidence of default. The company’s FHR has remained unchanged since the prior quarter. 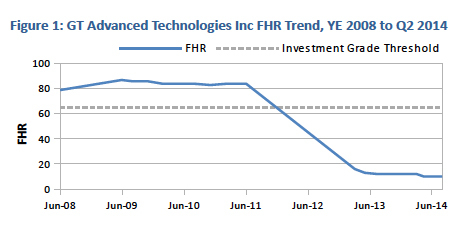 YOY credit quality has deteriorated: For the For the most recent period, the 12 months (rolling quarters) ended Jun 28, 2014, GT Advanced Technologies Inc has suffered a modest decline in financial health, as evidenced by a 2 point FHR decrease, largely reflecting deterioration in the company’s performance in working capital efficiency and cost structure. The quarterly score showed no change. Still Very High Risk: At the same time, the rating continues to depict a Very High Risk credit profile as overall profitability, debt service management, sales performance, working capital efficiency and cost structure are at low levels relative to the global data set. Clearly, these are areas in need of the management’s attention. Strengths:GT Advanced Technologies Inc demonstrates strength in leveraging relative to the global industry set, and has done so traditionally as well as currently. Exceptionally inconsistent history: From an historical perspective, GT Advanced Technologies Inc has displayed an exceptionally inconsistent risk profile as the rating has moved within five different risk categories during the period. Over that time the rating fluctuated from a high of 87 in FY 2009 to a low of 10 in FY 2014. YE 2009 marked the inception of a sustained period of decline lasting until 2013, as performance in working capital efficiency, cost structure and debt service management deteriorated. During this period the rating slid from 87 to 12 as the company’s risk profile deteriorated, moving from the Low Risk to the Very High Risk Category. GT Advanced Technologies Inc is currently 55 points below the investment grade threshold. Significant underperformance in generating returns: While the Return on Capital Employed (ROCE) in the most recent period, -38.11%, represents a significant underperformance but is a strong increase as compared to the previous full year at -47.02%, this measure is dramatically below the high point of 175.24% achieved in YE 2009. The range over the past three years has been between -60.08% and 84.81%. The bottom line: GT Advanced Technologies Inc is situated in our Very High Risk group, displays weakness in five of our six performance categories, demonstrates significant underperformance in ROCE and was downgraded in the most recent period. This suggests that to those for whom GT Advanced Technologies Inc represents an existing exposure, such exposure should be very closely monitored. For those considering GT Advanced Technologies Inc as a new or increased exposure, great caution is warranted. In the four quarters ended June 28, 2014, GT Advanced Technologies Inc had a ROCE of -38.11%, which is substantially below the generally accepted threshold range and indicates that the company is not making efficient use of its assets. A top performing firm has a ROCE of at least 15 – 20%. General benchmark levels for profitability and activity are around 10% and above 2.0, respectively (although these do vary, depending upon the industry). GT Advanced Technologies Inc displays very poor performance levels in the profitability to sales ratio and very poor performance in activity. Contrasting Return on Capital Employed (ROCE) with the cost of capital provides a window into management’s success in growing the firm’s value.¹ The company has a weighted cost of borrowing (WCB) of 12.12%. So as ROCE has been less than the WCB through the past four quarters, this generally suggests value degradation under management’s watch during the period. 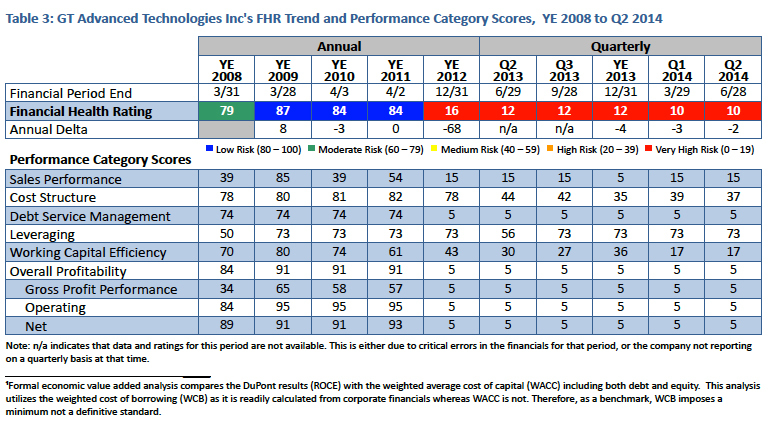 Table 3 presents the FHR and Performance Category Scores for GT Advanced Technologies Inc. Each rating period is labeled with the financial period end of the most recent financial reports incorporated into that FHR, as well as the release date for the FHR. The lag between the two dates is primarily due to the time required for the company to release its statements, and then for Rapid Ratings to incorporate the data and generate the FHR. For periods prior to the operation of Rapid Ratings, this lag is assumed to be 60 days for quarterly ratings and 90 days for YE ratings. In this section, we take a closer look at GT Advanced Technologies Inc, pinpointing current areas of notable strength and weakness in relation to past performance and in relation to other sector participants. The Sector Leaders and Sector Laggards indicate the performance of companies in the top and bottom tenth percentile of the sector for that performance measure. While the company shows strength in the following category, it must also be remembered that this company is operating at an elevated level of risk. Leveraging (73): Substantially different from the traditional leverage view, the leverage rate utilizes a variety of measures to consider leverage largely from the perspective of balance sheet efficiency. GT Advanced Technologies Inc’s score, a significant improvement over the previous 12 months, depicts a company which performs better than 73% of its global reference set. Overall Profitability (5): This score considers a wide variety of profitability measures, such as gross profitability, EBIT and others relative to revenues and several balance sheet items. GT Advanced Technologies Inc outperformed only 5% of its global reference set over the last 12 months ending June 28, 2014. This represents no change from the prior year. 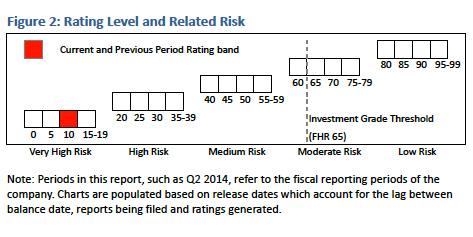 Debt Service Management (5): Indicating the company’s ability to make interest and principal payments, this score suggests an exceedingly weak debt servicing capability. GT Advanced Technologies Inc’s performance has remained unchanged from the prior year. Sales Performance (15): Considering operating revenue relative to assets, equity, working capital and other measures, this score remained unchanged from the prior year, and suggests that GT Advanced Technologies Inc outperformed only 15% of its global industry reference set. 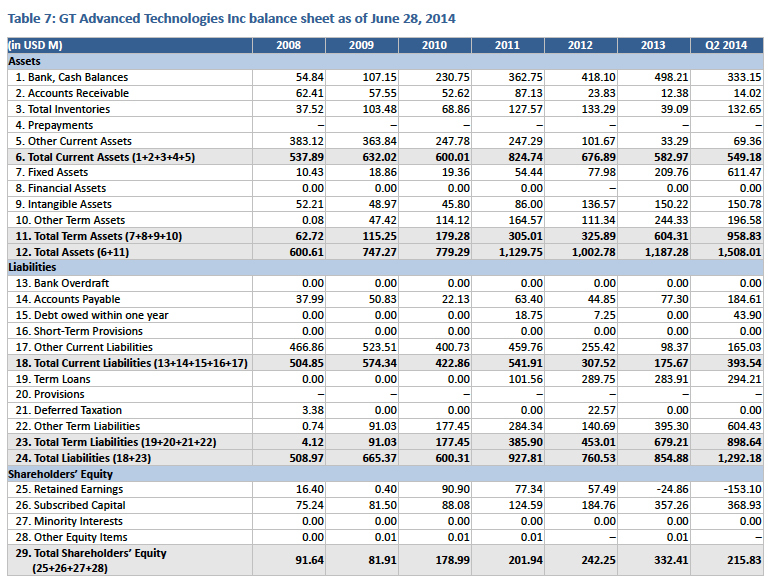 GT Advanced Technologies Inc is making an exceedingly poor gross return on capital invested. Working Capital Efficiency (17): This score measures management’s success in working capital efficiency utilizing various measures of the current position in combination with other balance sheet and income statement elements. Much weaker than the prior year, the score indicates substantial underperformance in this aspect of balance sheet management. Cost Structure (37): The overall cost structure rating is based on a number of ratios incorporating variables such as cost of goods sold, staff costs, other operating expenditures, depreciation, interest expense, and corporate income tax relative to a base such as total revenue and total expenditures. 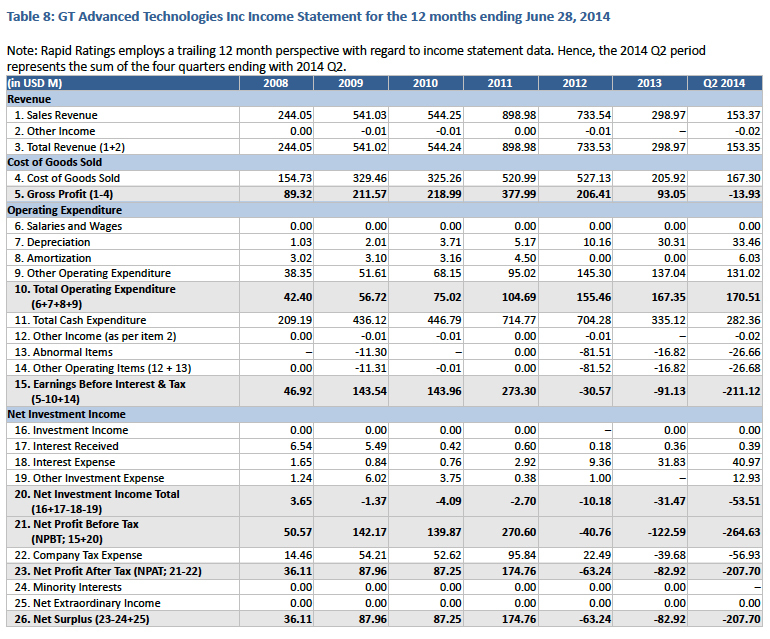 GT Advanced Technologies Inc’s score, a moderate decline from the prior year, depicts a weak cost structure. GT Advanced Technologies Inc’s current rating is unaffected by abnormal items. Simulated FHR is 10, Very High Risk. This period includes an abnormal item. 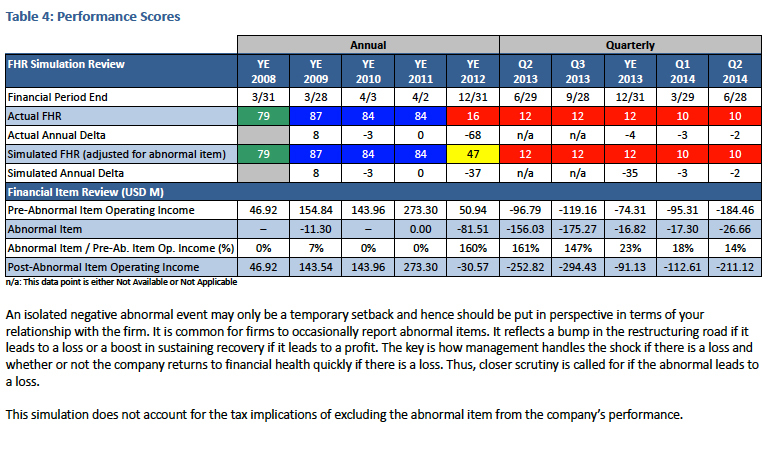 When the rating for this period is simulated with the abnormal item excluded, the company’s health is unchanged, suggesting the line item is not affecting the rating for this period in any way. The company’s year-on-year rating delta using the simulated rating is -2 compared to the published delta of -2. GT Advanced Technologies Inc’s current trailing twelve month financial period includes an abnormal loss of $26.66 million USD. Pre-item operating income for the company was already negative, and this item has not affected the rating. While the drop in FFO is clearly a disappointing development, also of great significance is the fact that FFO was negative during both periods. The debt load fell, from $297.00M at 2012 YE to $283.91M at 2013 YE. 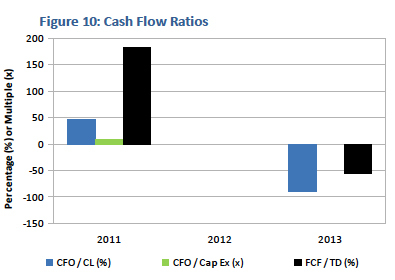 FCF/TD levels of this magnitude can indicate a challenged solvency profile. 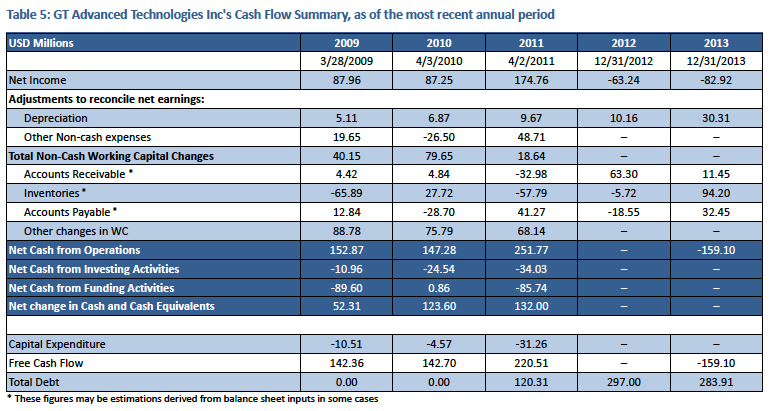 GT Advanced Technologies Inc’s CFO to Current Liabilities (-90.57%) indicates a weak level of cash flow coverage, but the FCF to Total Debt (-56.04%) indicates a very weak level of cash flow coverage. The company’s headquarters are located at 243 Daniel Webster Highway, Merrimack, NH 03054, United States.